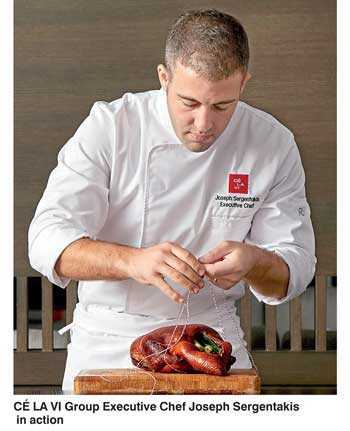 CÉ LA VI, Singapore Group Executive Chef Joseph Sergentakis has shared his expertise by curating the menus for the upcoming CÉ LA VI Colombo, which will adorn the striking rooftop of The Kingsbury Hotel. When enquired about his experience in the food and beverage sector, Joseph recollected how he embarked on a challenging yet exciting journey at the tender age of 16. His aspirations to become a chef was naturally inculcated from a very young age, as Joseph’s family had strong ties with F&B sector. His father was a Chef and grandfather was a butcher, which in turn paved the way for Joseph to kick start his career as a chef at a restaurant in Brooklyn, New York. Joseph has served in both Europe and Asia, mastering in French as well as Asian cuisines to expand his culinary repertoire. With a new found passion for Asian gastronomy, he has explored a number of countries like Vietnam, Thailand, Shanghai, Japan, Malaysia and Indonesia seeking sensational flavours that defines authentic Asian taste. 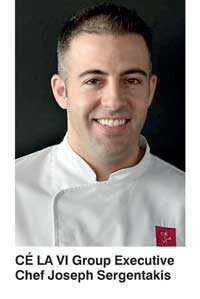 Under the mentorship of Chef Gray Kunz at Café Gray Deluxe in Hong Kong, Joseph broadened his horizons in the world of culinary art. He was instrumental in making Café Gray Deluxe win the prestigious Michelin Star, and become one of the top 10 restaurants in Hong Kong. Joseph also garnered international exposure during his stints at leading restaurants in Switzerland and France while enjoying the privilege of working alongside Michelin Star chefs. Moving up the corporate ladder while amassing expertise in the food and beverage industry, Joseph entered CÉ LA VI Singapore as their Group Executive Chef. He has played a pivotal role in introducing CÉ LA VI’s signature menus, delivering a gratifying multi-sensory experience for its diners far and wide. As Joseph explains, his cuisines are predominantly Asian and incorporates some of the finest cooking techniques inspired from the French and European. Expressing his views on the upcoming CÉ LA VI Colombo, Joseph noted that prior to curating a menu for a new restaurant, they would work closely with the local team and conduct market research to obtain an in-depth understanding of the local produce as well as the taste. A similar study was conducted in Colombo which spanned for a year, and at present, preparations are underway to launch CÉ LA VI Colombo’s exciting menu. CÉ LA VI Colombo will feature a fine sushi bar, which will delight local connoisseurs with the country’s finest seafood delicacies. The restaurant will also serve Teppanyaki, a highly sought-after Japanese dish cooked on iron griddle, along with the option of reservation in advance. With CÉ LA VI venturing into some of the most prestigious locations across the world, the brand is rapidly widening its scope, reaching out to an unprecedented fan base. CÉ LA VI restaurants are renowned for offering the most stunning vistas in the town, complemented with internationally acclaimed dishes with a touch of local flavours.